Today I received this touching card with a note for me and one for Erin. Joanne had a Mass said for Erin at 8 am this morning at St. Anne’s Church in Lodi. So, Clark and I got up at 5:30 am and left here at 6:40 am afraid of heavy traffic on Hwy 99. Traffic was heavy the other way, but we breezed down there in 40 minutes with 40 minutes to spare. Joanne joined us in the church, then afterwards we went back to her house to wait for the air-conditioning repairman who was to come at 9 am. 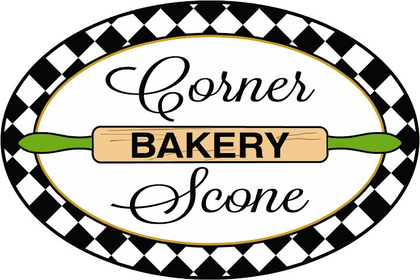 When he had not arrived by 10 am, Joanne suggested that we go ahead and place our order at Corner Scone Bakery, and she would come on in 15 min. She left a note for the repairman, and when she got back home around noon, the note was still there! When I talked to her around 12:30, he still had not come. 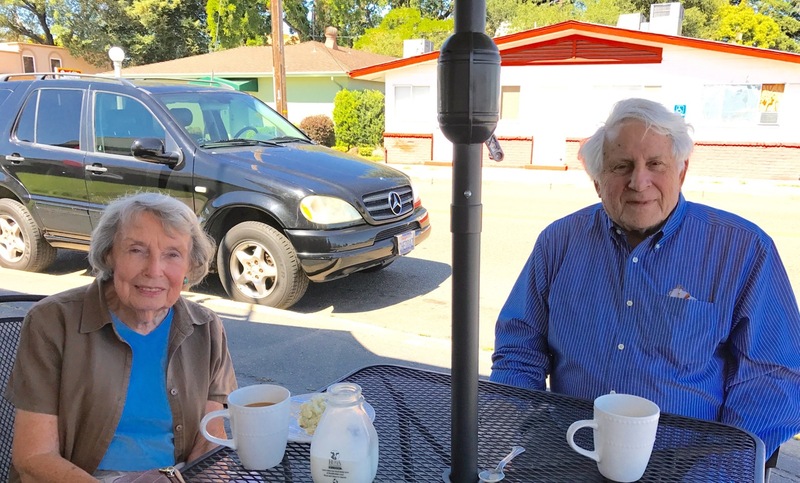 We had a delightful cool morning eating scones and quiche outside, and discussing Erin and Joanne’s daughter Mary who died of cancer 5 years ago, 2 days short of her 48th birthday. 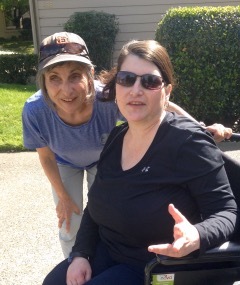 Joanne taught speech in high school in Sacramento and we were roommates in Sacramento for 6 months before I broke my leg skiing in March 1961. Erin was very fond of Joanne and would sigh in happiness on holidays when exceptionally cute cards would arrive from Joanne. Charlie Duff, who taught Math at Sacramento City College with Brandon Sr. sent this one (tiny) photo that he had of Erin, taken in Brandon’s office. 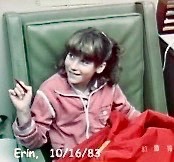 It is dated Oct. 16, 1983, so Erin would have been 12. She looks so little and young! Erin must have been sick, so Brandon took her to work with him. I didn’t return to work until Jan. 1984, so I must have been involved as tournament chair of the weekly golf tournament at Hoffman Park. 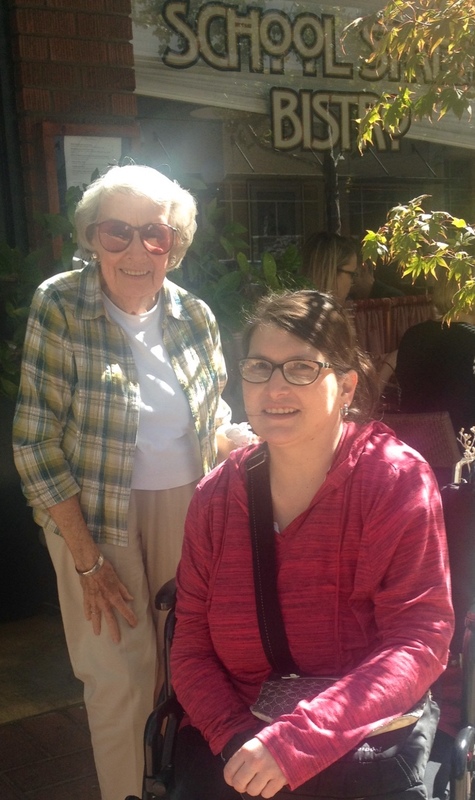 Today my social bridge friend, Mary Claire O’Connor, came and took wheelchairs, walkers, eating tray, etc. to her parish, St. John’s in Carmichael, where they a have a closet for parishioners who need such equipment. Thanks, Charlie and Marie and Mary Claire! 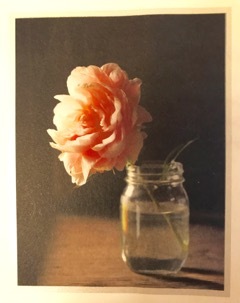 “I wrote to Erin/you a few years back- when I had been reading her blog for some time. I have continued reading it, and it has felt as a gift to follow you through your ups and downs the last few years. It has been such a hopeful ‘place’ to visit, and at the same time has felt honest and open about the difficulties and sacrifices you all have endured. Life can be beautiful and brutally harsh at the same time. Following your courage to keep going, continuously looking for the bright sides of It all, has been a true inspiration. I am so sad to hear about your loss. I am also happy to hear that Erin left this world in a calm and not too painful way. My heartfelt sympathy goes out to you and Erin’s family and friends. “I myself was diagnosed and had my first surgery in January 2010 . My tumor is an astrocytoma grade 2/3, so the prognosis I got back then was less grim than Erin’s. Such positive feedback from a reader is very heart warming.! The following is a letter from Barbara Bravos who was the hospice worker volunteer when Erin was on hospice in 2012. Barbara turned out to live just down the street from us. She came every Thursday night for 8 months so that Clark and I could play bridge.Though we were supposed to be allowed 4 hours, Barbara generously said not to worry if we were actually gone 4 1/2 hours which is about the minimum amount of time to get to bridge and back and play a session of bridge. “I am so sorry for your loss of Erin. “I first met Erin in January, 2012, while she was in the care of Kaiser Hospice and I was your volunteer. Erin and I just ‘clicked’ from the first time we met. I enjoyed my Thursday night visits to your home and the chats that Erin and I shared. I had never watched “Big Bang Theory” before; Erin now has me hooked on that show! We often watched the re-runs and then the new show on Thursday. “During my time with Erin I caught glimpses of what she had been before her illness. What an amazing woman! During her short time on earth she accomplished so much. “In September of 2012 Erin was taken off hospice. We stayed in touch and would sometimes walk around the neighborhood together. She was a fighter and wanted so much to go back to the life she had “before”. 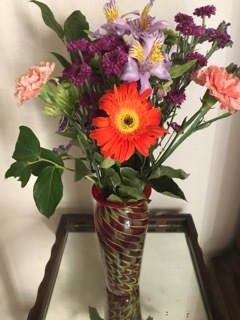 “Erin had great support from you and your family. I was impressed by that and glad for her. She enjoyed it when Colleen and Wheeler lived at 510 Hartnell. Erin was pleased for Colleen when she moved to Colorado with Deke. “Brandon, Lisa, and Beck also living close by was wonderful. “I am sure that Steve knows that he was the ‘love of Erin’s life’. She was proud of the life they made together and of their sons. “Paco and Tommy were EVERYTHING to Erin. While she will always be their mother, Erin felt terrible that she couldn’t really ‘mother’ them and be there for them. Erin will always be a part of those two boys. I hope they get to know more about her as they grow older. “ Barbara and Clark, you must know that Erin was so happy that you two got together. She knew that you both care immensely for each other and that gave her great joy. “It was my pleasure to get to know Erin and to meet her family. You are in my thoughts and prayers during this difficult time. What a gem Barbara was! “I really appreciated the opportunity to gather together with your family and friends to celebrate and remember Erin’s life. I hope you didn’t find it odd that one of her classmates should show up out of nowhere after so many years, but Erin was always so dear to me and I never forgot about her. She showed me so much warmth and kindness, and I simply adored her in a way that I can hardly explain. So many people come and go from our lives over the years, but few people have ever had the impact on me that she had. Regrettably, I didn’t have the courage to tell Erin how important she was to me back then, but it does my heart a lot of good to tell you now. 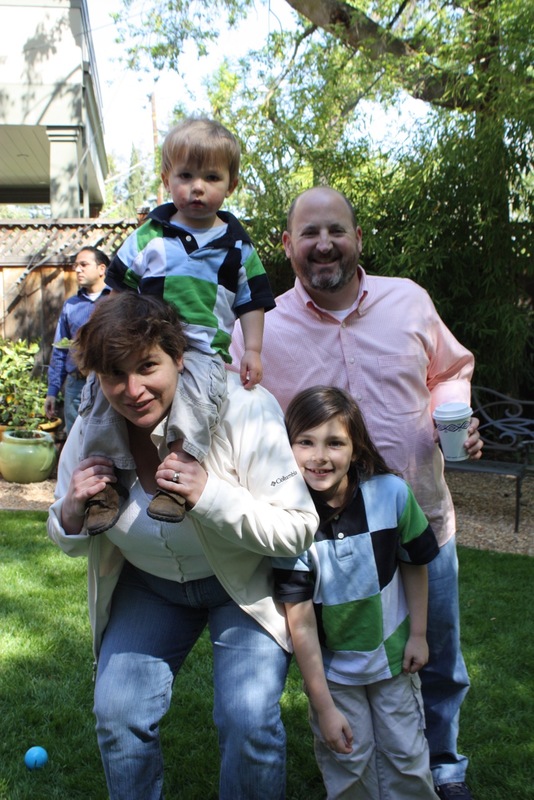 “I was delighted to know that Erin had gotten married to Steve and that she had two beautiful boys. I was also comforted to know that she had the constant support of her entire family throughout her struggle. When I was a freshman in high school, I lost my oldest sister, Mina, and I remember the pain it caused my family and my mother in particular. I think that’s why I feel a certain kinship with you and Colleen and Brandon. I’m just in awe of the strength of your family. Such a touching message …. I am sure Erin had no idea of how she affected this man’s life. Carolina sent these photos of visits that Erin and family made to San Jose after they moved to Davis when Tommy was just a couple of months old. 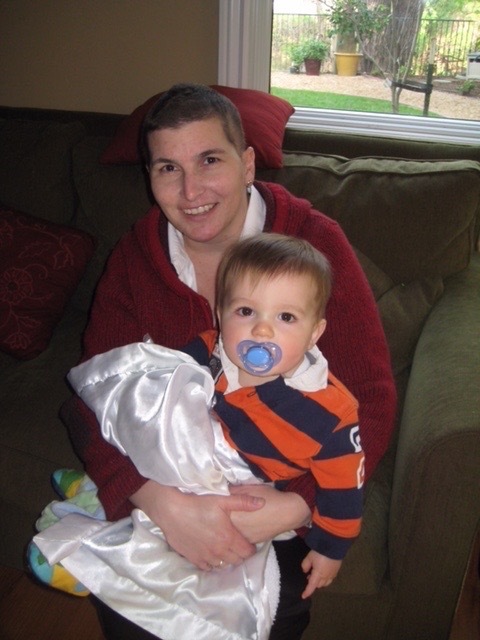 This photo of Erin and Tommy was taken Feb. 14, 2010, when Tommy was 11 months old, 7 months after Erin’s 1st surgery. Erin, Tommy, Paco, and Steve, April 10, 2011. This would have been a month before Erin’s 2nd craniotomy. One of Erin’s 3 trips to Argentina was to attend Julieta’s wedding.